Depending on whether the used metal is treated with any chemicals or heat, it can proffer a broad array of iridescent surfaces. Bronze and brass are the two forms of metal, which are closely related to each other and are often used for the cast-metal figurines. For the beginners, bronze is the ideal metal for making sculptures because of the intricacy that can be obtained while carving out the statuette and after completing the work. Iron is another very common metal that is available on this planet easily and steel is the alloy of this substance. The art company suggests that this is the best choice for outdoors because of the durability and strength of the metal. Metal sculptures may take on several diverse forms of natural objects as well as unique abstract forms. The manufacturing company for Garden Sculpture Art in Kolkata conducted an online survey of the diverse forms of metal art and listed out the top ten major categories of dynamic garden sculptures. These incorporate religious motifs, birds, pets, wild animals, water-related animals like seahorses, turtles, fishes, etc, fountains, still life, floral, leaves, trees, weird caricatures, and different household objects. The sculptures that are created using different metals can be used differently and can be placed in different nooks and corners of the space. Some of these metal artworks can be placed in the garden area or balcony of the house as well as in the corners of the dining room or living room of the house. Different forms of sculptures are carved to decorate different spaces. However, the small-sized sculptures look good when kept indoors whereas the fountain forms look extremely striking in a garden. One can even place a few cute forms in the bedroom too. Big sized outdoor metal sculptures are not only purchased by the owners of the residential properties but these art objects are also found on the public parks, art museums, etc. People visiting these public places get attracted by these dynamic masterpieces. Several forms of metal sculptures are exclusively created for indoor spaces. 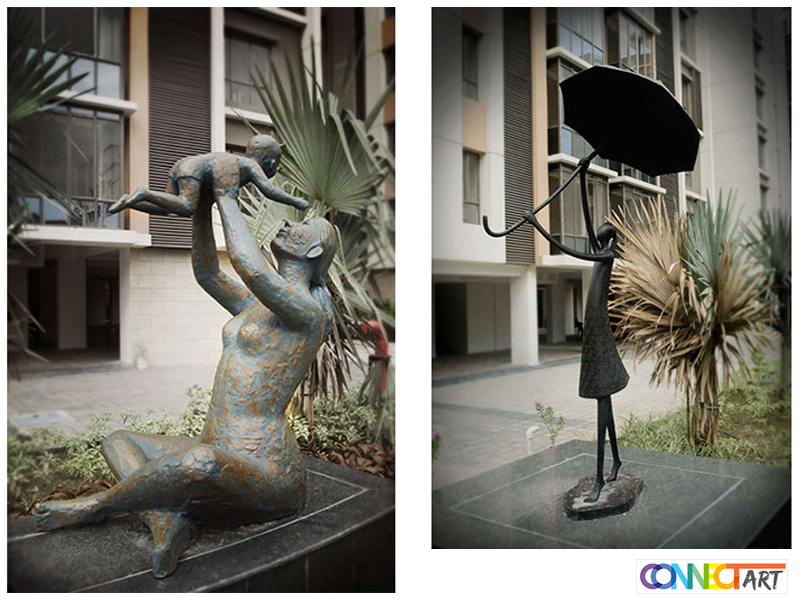 These artworks can be also used as wall hangers or can be placed with the purpose of filling up an empty lobby area. Sculptures in the form of simple comb-like fish are one of the most common forms. Similarly, many other smaller ones are used purposely for garnishing the indoors.